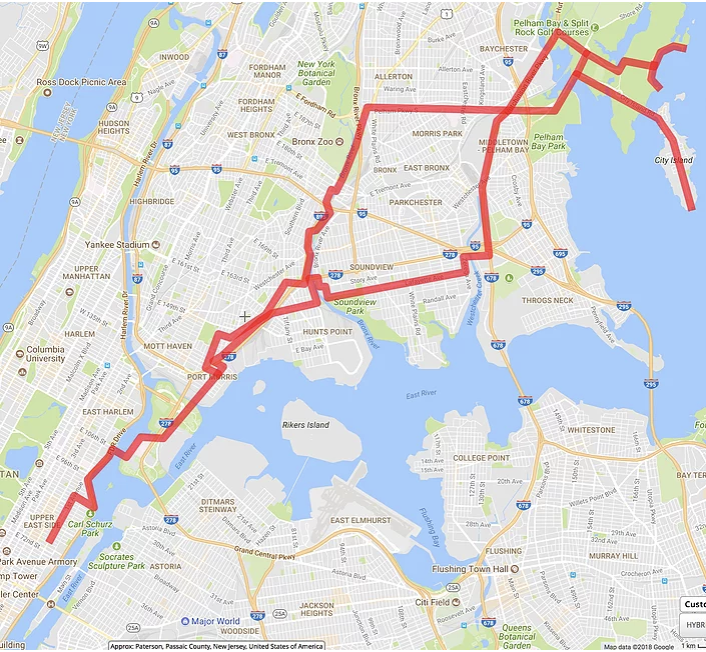 This tour goes to Orchard Beach in the Bronx, riding on some of the best hidden greenways NYC has to offer. Finding these greenways isn’t easy, but with this tour, you will be guided in the right direction. We will ride to Orchard Beach where you can take in some sea views. We will find us a place where we will have some delicious sea food for lunch. After lunch, we start our greenway journey back to Manhattan. Optional ferry service is available for this tour. We put the bikes on the ferry and ride up the East River to the Soundview section of the Bronx. From there, we ride the greenway toward City Island/Orchard Beach. The ferry would take us to/from the Soundview section in the Bronx and would bypass most of the local streets. The only negative is missing the Randall’s Island Greenway. You can always choose to ride the ferry one way and ride the bike one way, ride the ferry both ways, or ride the bike both ways.